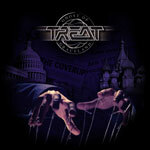 After disbanding in the early 90's, Treat returned to the scene about a decade ago with a best of album, also including a few new songs, but it wasn't until 2010 and their last record, Coup De Grace, where they really set a proper mark to their comeback. That piece is indeed nothing but a magnificent creation, in the realms of lighter hard rock, and therefore in their fans' eyes I think the expectations for this new record have escalated to enormous proportions along the road. It's been 6 years, obviously, and such extended periods between records usually give people well enough time to think over what situation they want to be in when they finally enter the full and intense part of the songwriting process and getting closer to the making of the album and consequently I wasn't the least surprised when the band stated that they had approached their original sound again. Partially I must agree to the truth of this statement, but the reality is that this record is made with today's standards, where things aren't the same anymore, and I can definitely hear quite a big resemblance to the previous effort as well. Treat plays music without an unnecessary experimenting of a solid foundation though and is more focusing to come out with songs with a wow factor based on catchy moments and nice melodies instead. Admittedly, guitarist and main songwriter, Anders Wikström, lays down lead vocals on a song for the first time, but apart from this occurrence I think that this whole making is mainly just about kind of basic melodic hard rock, that often is quite heavy hitting in the end, and I believe that the band's followers, when they're beginning to feel the groove after a few spins, will appreciate the growth with Ghost Of Graceland. A few years ago there were some uncertainties whether this unit would keep on going or put it to rest forever, but as long as people seem to like it, I see no reason to why they shouldn't continue what they're doing. This new effort isn't really able to climb all the way to the top of the mountain, like its predecessor did, but some songs are in fact really awesome and although the entire album doesn't make your blood really rush rapidly through your body, it's still a good album to listen to at the end of the day and I think that Treat manages to deliver a solid effort yet again.